Regardless of where you reside - whether it is a house or condo, having a good bathroom is essential. A beautiful, well functioning bathroom gives you a reason to come home and a good spot for relaxation at the end of a hectic day. If you are thinking of remodeling a bathroom to make your dream a reality, it is essential to get the details right. Here are a few tips to get you through your upcoming bathroom renovations. What’s the time frame for your bathroom makeover? How fast do you want your bathroom remodeling done? This question is important seeing that it helps you key in significant decisions for the project. If you do not have an urgency to complete the bathroom makeover quickly, you could choose to do it yourself. However, if it’s the only bathroom around and you need a quick turnaround, you’ll want to hire a professional bathroom remodeler for the job. 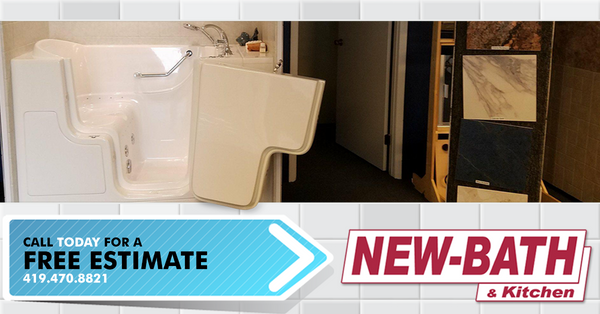 Toledo New Bath can update your bathroom with a one day makeover! Ask us how! You probably have a picture of how you want your bathroom remodeled. Do you want to re-position structures, have them eradicated or just have new ones installed? Perhaps you want medicine cabinets installed, a change in floor tiles or to install a shower? You will need to keep account of every detail and change that involves the remodeling. This will help you plan and budget wisely. It gives you a realistic figure that you can choose to keep adjusting until you get to a point that’s satisfactory. Until it's done, you only have a dream of how you would want your bathroom transformed. To get tips on how to clear the vision, do your research. Browse through the internet for some useful concepts and pick whatever excites your eyes. You could save the images and discuss them with the contractor you want to hire for the remodeling process. You could also just stop in to one of our two local and conveniently located showrooms and find inspiration there. You don’t want to use your entire income on a bathroom transformation, and yet you want to make a good investment into it. Budgeting for any project is the real test to gauging your self-control. Luckily, with a realistic attitude and a wide array of finishes and fixtures, budgeting shouldn’t be a hard-on task. You might want to start by researching the prices of the individual additions you want, compare prices in different stores, get a reasonably priced contractor and factor all other expenses required. If you need to cut costs, a tub liner could be cheaper, but still sturdy alternative to replacing the tub or show. A proper budget should help you find a balance. Essentially, even if you are to renovate through “do it yourself” tactics, there will probably be a few areas that you would want to engage with a contractor before you invite in a disaster. Consider bringing the expertise of Toledo New Bath on board for all your bathroom makeover needs. You will be guaranteed quick workmanship to help you adhere to your deadline. Whatever your desire, you can depend on Toledo New Bath for a unique and personalized bathroom look. Plus, we’ll work within your budget and advise where possible.